We hosted our 9th 3Dexpo on October 10th, 2018, in Halmstad, Sweden. Almost 100 attendees joined us for a day full of interesting presentations focusing on VFX, Post Production and Moving Media. 3Dexpo is the Scandinavian event where 3D professionals meet to network, gain valuable insights from expert speakers, and pick up on the latest industry news. You will gain useful knowledge on how to enhance your workflow to speed up production and improve final results. The exhibition area offers a great opportunity to explore the latest advances in 3D technologies. 3Dexpo is an intimate event – with limited seats – and is free of charge, with lunch and refreshments included. Visionary concept artist, Aaron Sims (Stranger Things, Planet of the Apes Trilogy) reveals the secrets behind Aaron Sims Creative's creature and world-building designs and visual effects for some of the most iconic film and tv franchises of a generation. He will share never-before-seen assets created for award winning filmmakers including Steven Spielberg (War of the Worlds, Ready Player One), Michael Bay (TMNT, Transformers Series), James Wan (The Conjuring, Lights Out), and The Duffer Brothers (Hidden, Stranger Things). Through a series of original concept designs, 3D models, previsualization and visual effects breakdowns, he will demonstrate how your favorite superheroes, villains, and monsters are brought to life ... from Sketch-2-Screen. Before joining Chaos Group in 2013, Yana Andreeva worked as a 3D artist on campaigns for Intel, Hugo Boss, Porsche, and Red Bull. She has a bachelor degree in Audiovisual Media and a masters in Digital Arts. V-Ray Next’s GPU improvements and smart new features offer flexibility, customization and powerful results. Explore how V-Ray Next’s new GPU-accelerated look development and production features will speed up your workflow in Autodesk 3ds Max and Maya. Showcasing NVIDIA’s new AI Denoiser for fast noise-free IPR previews, GPU rendering of volumetric effects, the new V-Ray Next Hair Material, and denoising separate render elements for compositing are among some of the features. Also: real-time V-Ray scenes with V-Ray for Unreal Engine and an overview of upcoming features, such as GPU support for Cryptomatte and the V-Ray AL Surface Material for realistic skin. The new V-Ray Cloud lets you render high resolution images incredibly fast! Brett Richards is an award-winning Creative Director and founder of Brokendoll, a boutique creative studio based in Stockholm. Brett led the design and development of the graphics packages for Eurovision in 2013 and again in 2016 with audiences in excess of 200 million viewers. He directed launch campaigns for both the Swedish Hockey and Football leagues and has creatively led strategic rebranding of channels for all the major Swedish broadcasters including SVT 2, TV3, TV 4 Fakta, Kanal 5 and TV 12. Brett’s directorial work has been featured in Shots Magazine, and he has received numerous awards and nominations including from Promax, The Bass Awards, ADC, FWA, and the Nordic TV Awards. Brett will show us a cost-effective workflow with extraordinary VFX and post-production results using MAXON Cinema 4D and Adobe After Effects. John Paul Giancarlo has been working in the TV/film industry for over 15 years. He started his career as a lighting artist for Brown Bag Films and quickly made the jump from TV series to commercials to be the studio VFX Technical Director and generalist. He has also worked as Tech R&D TD, Look development Artist among other disciplines, he was instrumental in integrating Autodesk Maya and Autodesk Shotgun in Brownbags’ Pipeline and has worked on Emmy awarded TV show "Doc McStuffin" on Disney Jr, Octonauts on CBeebies, Peter Rabbit on Nick Jr, among others. He has also done VFX work for famous artists like Shania Twain and Mariah Carey, and collaborated with other artists on the Emmy Awards, American Idol and much more. In this presentation, John Paul will talk about the new direction Bifrost 2.0 in Autodesk Maya is taking and how this can change the VFX industry. Hugo is an award-winning Director, VFX Supervisor, and Lecturer. During his career, he's worked at the BBC, Nexus and The Mill, where he was the Head of Nuke Compositing and a VFX Supervisor for 4 years. Since 2014, Hugo has been working with Fire Without Smoke as a Cinematics Director in the triple-A games industry. He has directed and supervised trailers for Activision, Ubisoft, Square Enix, Sony, Deep Silver, CCP, Fatshark among others. Hugo will present behind the scenes for latest Warhammer: Vermintide 2 Live Action Trailer created by Fire Without Smoke for Swedish developer Fatshark. He will showcase every aspect of the production and post-production of this epic trailer. Including the Motion control shoot at Stiller Studios, Sweden, the miniature work, the photogrammetry pipeline, the Houdini simulations, the deep compositing pipeline and much more. Filmgate is a Swedish visual effects studio working with feature films, tv series, and advertising. The company was founded in 2006 and has since completed work for over 130 feature films. The main office is located in Gothenburg with a satellite office in Stockholm. Filmgate also has a production company, Filmgate Films. 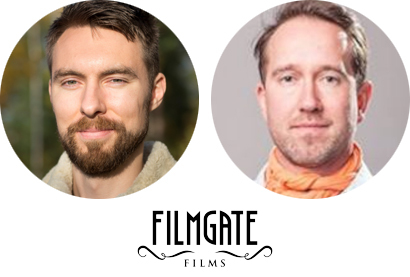 Magnus and Henrik will show us Filmgate's creature work on the Indian horror feature "Tumbbad". They will also break down their VFX work on the newly released action packed Norwegian disaster movie "Skjelvet" ("The Quake") for which Filmgate created set extensions and CG environments. In the exhibition area attendees got to see a wide range of 3D printers (such as Form 2 from Formlabs) in action, HP workstations, Wacom tablets, and other 3D related hardware. Adobe experts was there to answer any licensing questions.